This year, avid fans of Strangers Things, like myself was disappointed to see that Strangers Things’ new season would not be premiering in October, but instead next year. Viewers were left trying to fill in the gap this year without their fill of the next chapter in the town of Hawkins, Indiana. Instead, this October, Netflix decided to debut their new original horror show, The Haunting of Hill House. The series is based off Shirley Jackson’s novel which explores the idea of the haunted house as a body. 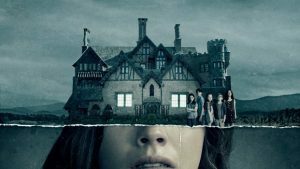 The series follows the Crain family in the past and present as they deal with their haunting past in the Hill House. There is the patriarch of the family, Hugh who is a loving husband and father to his family. There is Olivia, the matriarch of the family who is deceased due to an unknown tragic event in the first episode. They have three daughters, Shirley, Theo, and Nell; and two sons, Steven and Luke. The family moved into the house years ago as the parents were renovating the house to sell it in the housing market. Their stay becomes unwelcome at first, the ghosts start to freak out the kids, whereas the parents only chalk it up to being kids with active imaginations. Slowly things happened that cannot be explained by simple coincidence. On a fateful night, tragic strikes the Crain family as, they are forced to move out, without Olivia. With the intercuts of the past and present, each one of them dealt with their trauma in different ways and have their own demons. 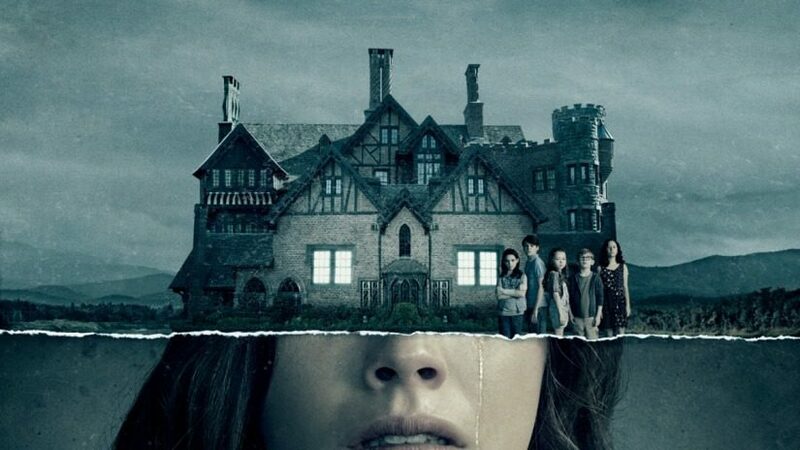 While the show is advertised as a horror series, the show deals with trauma, addiction, and mental illness with the metaphor of the house as the body and mind. The house traps the family with illusions and haunts them with their past. Every time a door slam is closed, or a window shatter is a metaphor for the conflicts the characters have with themselves, mentally and physically. They cannot escape the memory of the house. It is something they cannot escape, and no one will believe or hear them. Some of them can escape but unfortunately, some characters cannot escape the house. The ghosts in each one of their lives acts a personal demon, it isn’t only about scaring people just for the sake of it but using subtle horror to scare us with a paranormal ghost thing but also scare us with the way grief and trauma latch onto us, they’re always there in the background, which is just as scary as ghosts and demons. For Nell, it is the Bent Neck Lady, which is possibly her mental illness haunting her. For Luke, there is the tall man with a top hat that follows him, which is possibly his heroin addiction. It is not the typical horror that we would usually see in this genre. The scares will have you screaming sometimes, but also crying, not out of fear but also in empathy with the character and perhaps dealing with our own monsters. The show does not try to scare the audience just for the sake of being a horror. It does it subtly, but the scariest thing of all is perhaps dealing with grief and trauma. It is a horror series but there is the added complexity of family dynamics and conflicts with one’s body and mind. The show does leave us questioning whether the ghosts are actually real, or were they manifestations of the character’s grief and trauma?